We visited Bistro Jeanty on Father’s Day with two friends (both ladies). One of the friends with whom we were dining suggested the place. Amy gets the credit for another great suggestion. Bistro Jeanty as the name suggests is a French Bistro. It sits in the center of Yountville. 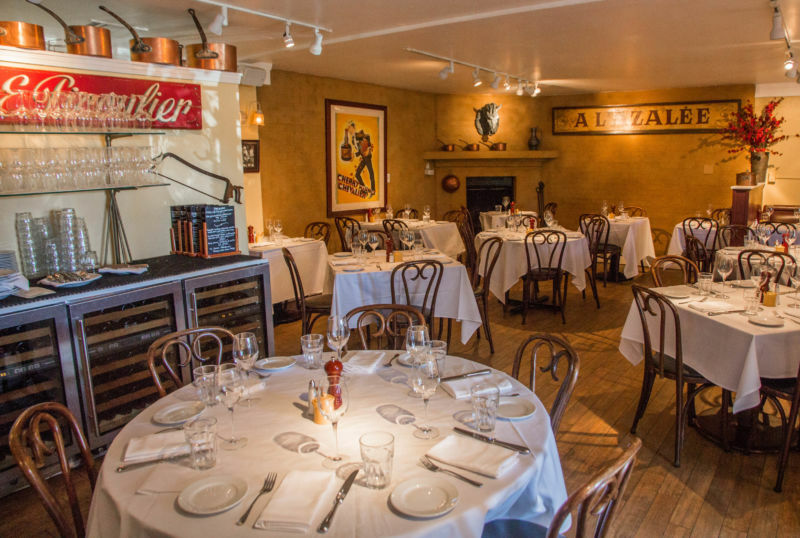 I didn’t think I had room in my heart for another fine dining establishment in Yountville, but I was wrong. This place hit all the notes; amazing service, beautiful food, and delightful atmosphere. The Brit comments: Yountville may have a population of three-thousand, but it is cornucopia of great places to eat. 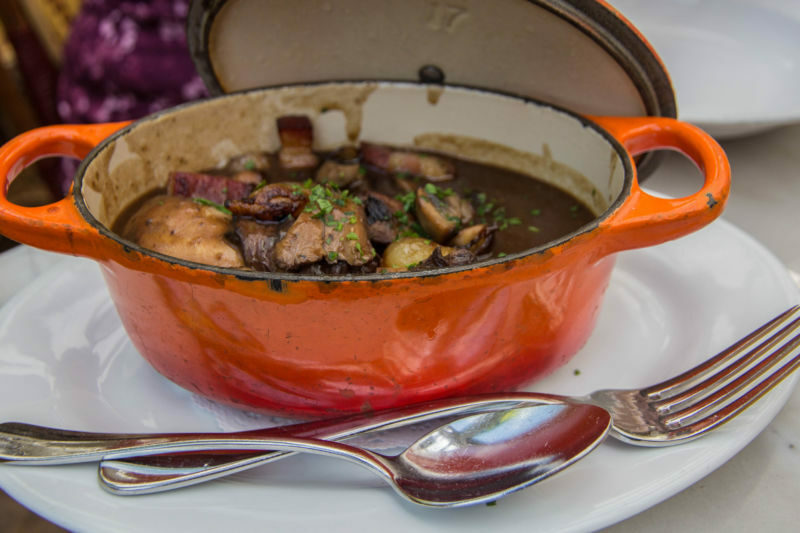 Two of our favorite Napa Valley restaurants are in this town and if this meal is typical we be adding Bistro Jeanty to that list. 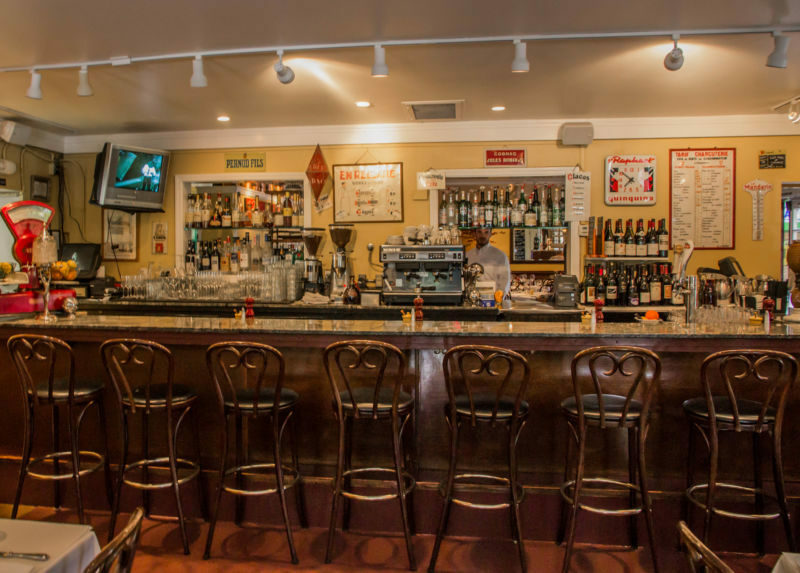 It has the look and feel of a French Bistro and the menu includes several Gallic classics; a couple of which we sampled on this visit. I think we were a tougher crowd than most that visit Bistro Jeanty. Our party consisted of The Brit, Amy who lived in France for a year, Maria who is from Spain and who enjoys good European food, and me. I l lived in the UK for 20 years; I cook and enjoy quality French cuisine. The restaurant looks very much like a Bistro you would find in France. The decor is simple and not overdone. There are two indoor dining areas and one outdoor patio. There is a front parlor, with an old-fashioned looking bar and a back restaurant area. It can get loud in the restaurant as there is a hard floor and not a lot of soft furnishings to absorb the noise. However, the warm woods and general atmosphere is welcoming. We opted to sit outside on the charming, covered patio. It was a little warmer than optimal outside, but it was still lovely. The Brit comments: The deciding factor in our choice to sit outside was that the sunlight would help with the pictures of the food; yet again showing our dedication to our valued readers. Our waitress Julie was wonderful. Actually, all the staff deserves congratulations. We were all raving about the efficiency of the service. I had a spill and broke my glass; it was cleaned up in seconds with about four staff there making sure no one at the table got cut. They removed the napkins on our table to make sure none had any glass shards. It was classy and right on point. It was excellent and what one would hope for from a fine dining establishment. Throughout the meal, water was refreshed, plates were removed like magic, bread was refilled, every single need was anticipated. We started out with each ordering a Sparkling Blush cocktail. It was a mixture of Champagne and Lilet Rouge with a ring of lemon to finish. What a beautiful drink.We all enjoyed this version of a champagne cocktail (even though I spilled half of mine – I did however get a new one). The Brit comments: Using Lilet Rouge, a close cousin of Sweet Vermouth, made for a fascinating drink; adding an herbal tang to the dry wine. The nose was dominated by the lemon ring, but the flavour was complex and pleasingly refreshing. 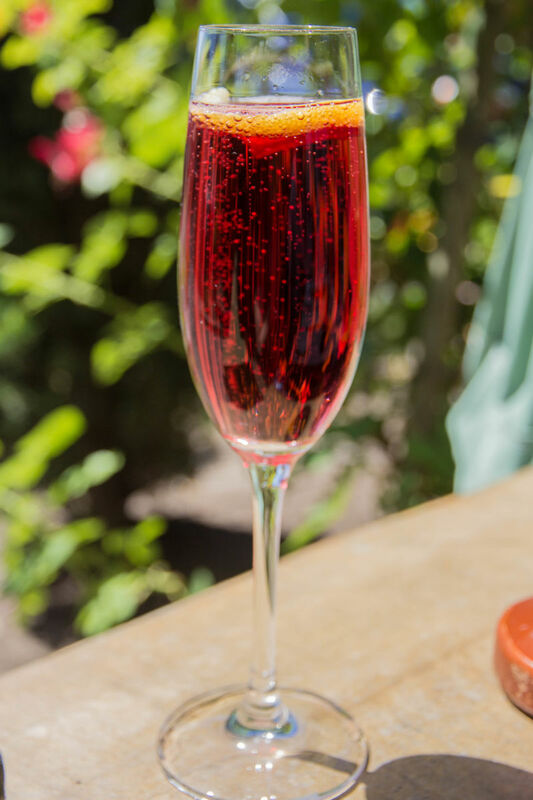 Tasting it has prompted me to think about using Campari or Sweet Vermouth with a sparking wine. I shall, of course, report back on the results of this experiment. 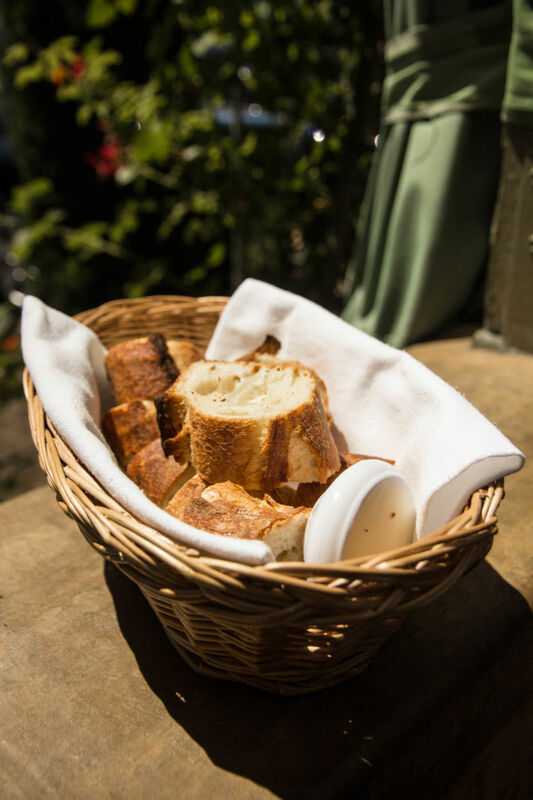 They presented us with a basket of french bread and butter. We could have all dined on just that, although I would have been happier had the butter been salted. I ended up adding salt to mine and then I was in bread heaven. The Brit comments: The bread had that wonderful combination of crunchy crust and light bread that one finds in France. I agree, though, that the choice of unsalted butter was disappointing. We decided to share two starters between the three of us. Smoked salmon and bone marrow. Both dishes were absolutely beautiful. The Brit comments: Astute readers might notice an apparent discrepancy between that last paragraph and the opening one. There is no error. Amy wanted to focus on the main course and opted not to share in our starters. The smoke salmon was a huge plate. 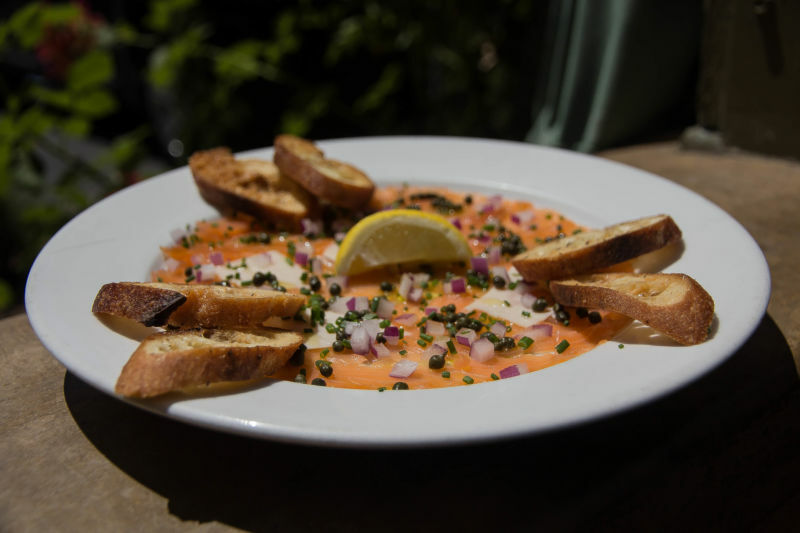 The salmon was lightly smoked and served similarly to a carpaccio. It was finished with capers and red onion and small shavings of parmesan cheese. There were also pieces of toasted french bread served with it. The Brit comments: The salmon was, according to the menu, smoked on premise. The balance in flavour between the fish and the smoke was spot on. 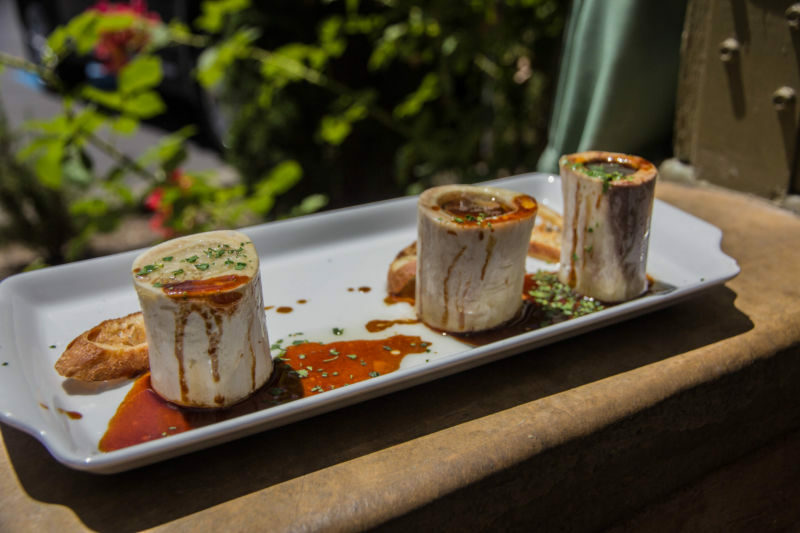 The bone marrow was served in 3 large bones with a rich au jus to finish the plate. Thankfully the waitstaff had thoughtfully brought us more bread as we were sopping up every last morsel of the marrow and the gorgeous au jus. It was rich, buttery, and so flavorful; roasted to absolute perfection. The Brit comments: This was the first time that I had tasted bone marrow. Based on this experience it shall not be the last. For our main courses we ordered: steak tartare, flamiche au poiraux (quiche), boeuf bourguignon, and coq au vin. 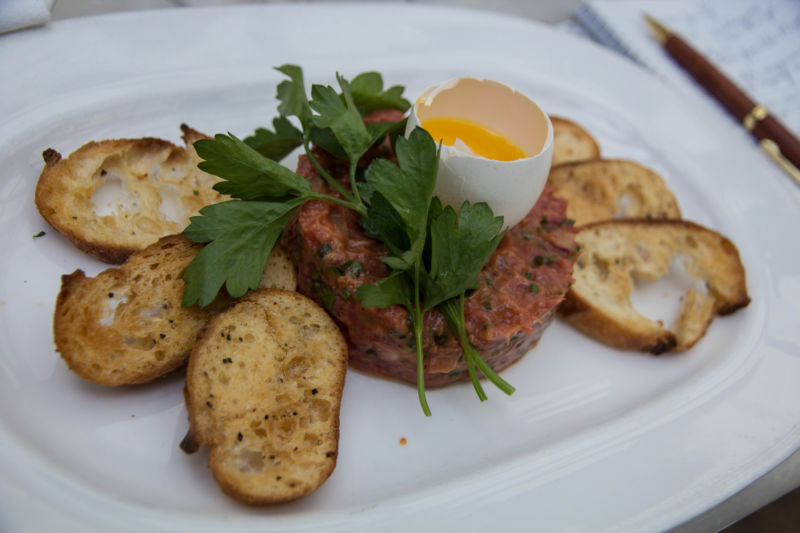 The Brit will always go for the steak tartare if he sees it. He really enjoys the texture of raw meat. You will notice a pattern in the way he orders. He’s a weirdo. I guess, however, that it is a good way to test the quality of a restaurant and their meat. There is no hiding poor quality meat or fish when it is raw. One misstep and it either tastes bad or makes your diners sick. In the case of Bistro Jeanty it was excellent. It was so beautifully presented and looked so appealing, I even had a bite. The flamiche au poiraux was a gorgeous quiche. 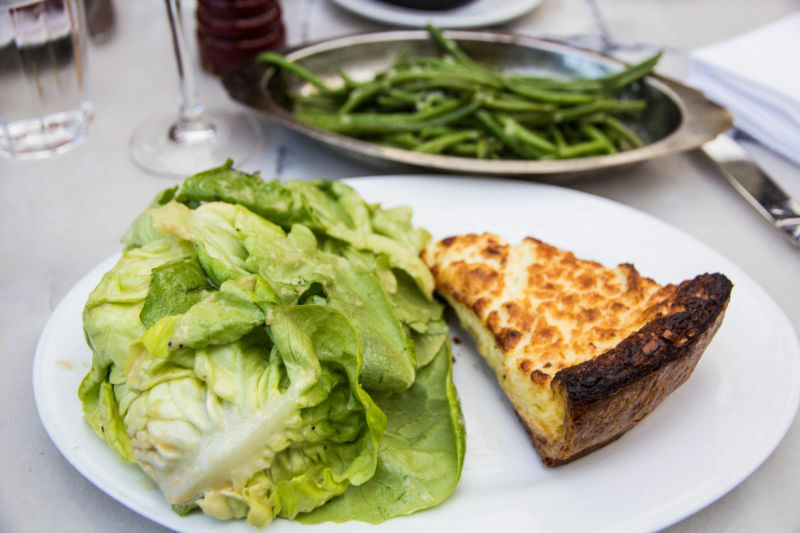 I adored its cook, which was a lot softer in texture than most quiche I have been served before. The Gruyere cheese was the star of the show in the dish and the flavor was outstanding. It also had a wonderful layer of ham at the bottom for a finish of meaty goodness to round it off. I have to talk about the crust. I don’t tend to enjoy crust, but this beauty was something special; almost a croissant crust, but with a little more density. It was outstanding. I would eat this dish again. The only thing that maybe I would have liked even more in this dish would have been a few sautéed leeks. However, it was great as is; rich, creamy, and delicious. Served with the dish was dressed butter lettuce I liked the dressing; it wasn’t your typical vinaigrette and I thought it blended nicely with the rest of the dish. I ordered a side of hericots verts (French green beans) and they were delicious. The boeuf bourguignon was prepared differently than I have eaten it before. It was drier than a typical stew. They served it with noodles, which were obviously freshly made. The pasta was slightly more al dente then it should have been. Overall, the dish was gorgeous. Every single component was flavorful and rich. 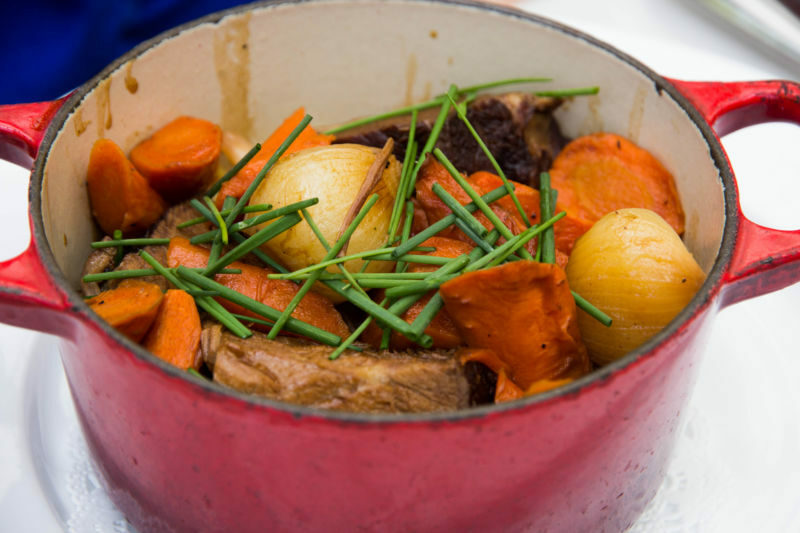 The braised short ribs were cooked to perfection. The carrots and onions were a joy. It was truly a feast for the eyes and Amy was really upset as she didn’t want to waste the food. We couldn’t take a doggy bag as we were moving on to a winery. You have never seen anything so pitiful as an Amy not wanting to leave food on her plate. It was a sad, sad thing. In the end she had to surrender. This could easily be a dish to share. I would do that in the future and have a starter and dessert. The Brit comments: Dear reader, I am sure that you are shocked by the revelation that we were going to a winery. I hope that you can suspend your disbelief and not suffer doubts about the veracity of this post. The last dish was the coq au vin. This was a beautiful, typical example of this dish. Plump chicken legs in a wonderful wine sauce. Mushrooms, rustic bacon, and onions filled out the dish. It was served with creamy mashed potatoes. They were flavorful and delicious. This dish was a winner all the way around. The flavors blended perfectly and was a joy in my mouth. It brought me back to my days in Paris, and my own preparations of this dish in my kitchen. The Brit comments: I am glad that California Girl’s memory is so clear. My recollections of her coq au vin seem lost in a now distant past. We were all so stuffed that it was hard to even think of dessert. They had a cherry dessert that some of us were looking at with interest, but it seemed too heavy. Finally we had the brilliant idea to share a crêpe suzette. I am so glad we did; a perfect end to a perfect meal. It was gorgeous, light, and with a beautiful orange flavor. It wasn’t overly sweet. We were all scraping up the orange sauce. The Brit comments: I recall this choice a little differently. 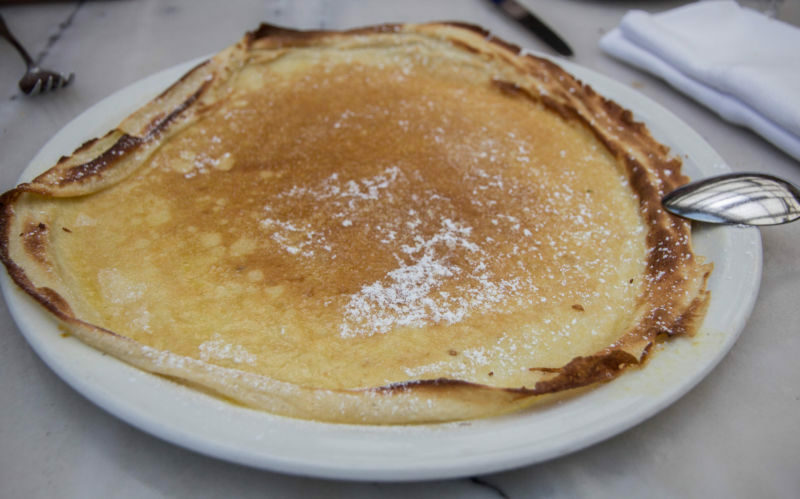 I saw crêpe suzette on the menu and I suggested it; not because it was a sensible, light option, but because it has been many years since I had last tried one. This example was cooked with Napoleon orange liqueur, which added a citrus bite to round the dish off perfectly. Our bill for this wonderful lunch came to around $70 each. Not cheap, but well worth the price for fine dining including alcohol. I would highly recommend a visit. I did see a couple of families here with beautifully behaved children, who were eating the fine food and not demanding chicken nuggets. I loved seeing that. I would suggest this restaurant is great for lunch or dinner, but best for when you are hungry and want something substantial. French food tends to be on the heavier side. I am told that the inside of the restaurant gets very loud so keep that in mind if you are looking for a romantic night. The Brit comments: I think an evening meal on what passes for a cold winter’s night in California would be the ideal backdrop for some of these rich French dishes. I look forward to validating my assumption later this year. Pingback: Silver Trident Winery – Yountville, Ca.